HomeBlogClick boardsThe 3xBuck click is here, tripling the results of a single buck click! The 3xBuck click is here, tripling the results of a single buck click! A triple step-down converter Click board™ has arrived! Featuring three independent output terminals that can provide 1.8V, 3.3V and 5V with the combined current output up to 3A, it is a perfect choice when an embedded application power supply is needed. 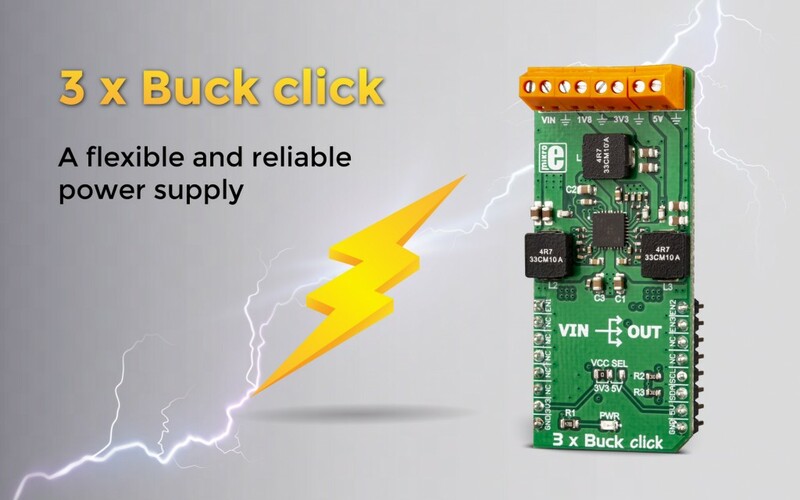 The three bucks can easily be set to a precise voltage, at a range as small as 10 mV. The voltage at each output can be switched to a programmable internal voltage divider, in cases when the output voltage fine-tuning is required. This can be done over the industry-standard I2C interface. The Click Board™ comes as a fully tested and approved prototype, making it a reliable device ready to use on the development board. It comes in the package which also includes the mikroSDK™ software and a library with all the functions.